For over thirty years I've edited other people's work in some form or other. I always did well in English at high school and I read voraciously, which is the best way to build editing, grammar, and writing skills. Back in the 1980s, I worked in the Department of Psychiatry as a secretary to Liba Tyhurst. She was editor of "TV in Psychiatry" -- a publication covering the effective use of video in therapeutic practice. Liba was a Czechoslovakian, and while she was a superb psychiatrist and teacher, English grammar was not her strong point. She was impressed with the way I edited her correspondence and patient reports and invited me to be co-editor of the newsletter. That was the beginning of my "official" career as an editor. While working in the Department of Psychiatry and interacting with the young psychiatrists in residency, I realized that maybe I could find a way to get a degree. Working in a university setting made me long to have a BA after my name, especially since I hadn't quite finished high school because my life went off in a different direction. I felt I'd never be as good as anyone else if I didn't get a degree. At the time, I had a husband who supported my going back to school and two boys—a teenager, Darin, and a seven-year-old, Geoff—who wondered why anyone would actually choose to go to school. A friend of mine, Bonnie Craig, encouraged me to talk with the registrar at UBC, who she knew personally. The registrar told me that my work history and life experience qualified me to register for first year, and he encouraged me to do so. I remember feeling terrified, moaning to my mother-in-law that I would be 34 when I finished. She said, "Well, dear, you're going to be 34 anyway." That was all I needed. She was right -- I could be 34 with a degree, or just plain 34. I was awarded a BA in English from UBC in November 1984. I have never been so proud of myself. The best thing about the four years was the actual process of studying and learning. I call myself a lifelong learner. Fast forward 20 years later, and much water under my bridge. I was working at UBC as a program assistant and doing some extra editing work on the side. I decided to register in a Continuing Studies course called The Well-Trained Tutor, having an interest in working directly with students. I finished the course taught by Ramona Montagnes and the late, much-loved, Judy Brown. I liked it so much, I signed up for the more advanced tutoring course. It was after I finished the courses and had tutored for a few years at the Writing Centre that Ramona, the Director, suggested I study for an MA so I could teach courses at UBC Continuing Studies. This appealed to me, but the logistics of going back to university were challenging. First of all, the idea of committing to a two-year master's program was daunting -- by now I was 62 years old. Most people are looking forward to retirement at that age. But then I got lucky. I've always been fascinated by autobiography and memoir and believe everyone has a story to tell. While searching the Internet one night for any degrees related to life writing, I found one. It was perfect -- a one-year program of study. But there was a problem. It was offered in England, I was in Vancouver, and it wasn't available online. Serious choices had to be made, and there was no getting around the fact that I would be leaving my home, my partner, my dog, and my life as I'd known it for the past fifteen years. I felt like I was sitting on a precipice trying to decide whether to jump or to step back into my warm and comfortable life. I jumped. I can now proudly say I have an MA after my name. I joke that it stands for "Mission Accomplished," but it really means "Master of Arts" in Life Writing. I travelled to the University of East Anglia in Norfolk, England, and had a memorable year, meeting new friends, visiting old ones, and opening my life to new possibilities. I kept a blog while I was away, so I'd have a record of my experiences. When I got back to Vancouver, Ramona asked me if I'd like to teach a UBC online grammar course. I now teach that course and taught another at SFU. As an editor, I work with a broad spectrum of clients, including government organizations, engineering firms, and fiction writers. I try to spend at least an hour a day working on my own writing projects. Which brings me to the second and overlapping phase in my continuing progress as a teacher and a writer. One day, way back in 1999, I was tutoring at the Writing Centre and noticed a brochure in the lobby inviting people to a Jungian writing circle at the home of Marlene Schiwy. I'd been reading Jung's works for many years and was drawn to learn more about these sessions. I contacted Marlene by phone and she agreed to let me join the circle. That turned out to be another major turning point in my life. The Wednesday evening sessions were a unique opportunity for me and others to explore and write about our lives through the writings of Carl Jung. Marlene held the space for all those Wednesdays as we sorted through the rich fabric of our life stories. 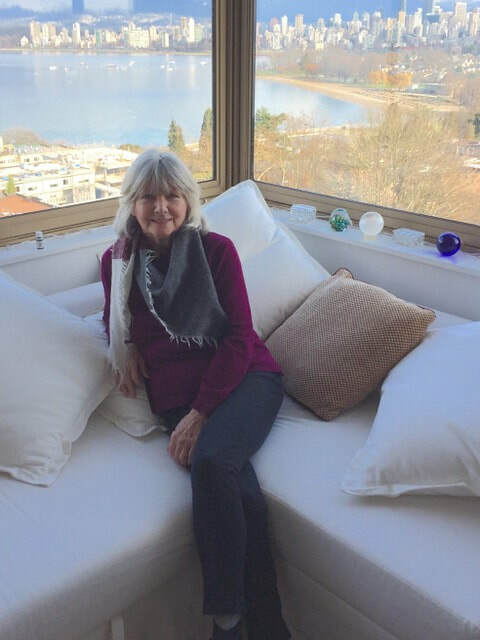 Her skill at guiding us in a safe and creative space gave us the freedom to travel inwards, which is absolutely necessary as we try to make sense of our lived lives. Over the past fifteen years, I've taken almost every course Marlene offers at UBC, including autobiography, journaling, memoir, and the summer writing intensives. I immersed myself in her week-long writing workshop in France in 2003, and was grateful to be invited by Marlene to the BodySoul Intensive with the eminent Marion Woodman in Santa Barbara in 2006, a crucial opportunity to help me cope with the overwhelming grief from the death of my son Geoff. These women and other people in my life have had a major influence on me and have encouraged me to keep challenging myself and to step beyond my comfort zone. I believe it's the only way to keep getting better at whatever it is you want to do in life. As Eleanor Roosevelt said, "Courage is more exhilarating than fear."